A “catastrophic” winter storm is unleashing a second wave of heavy snowfall on the US Northeast, as hundreds of thousands of people remain without power in the states in its southern wake. About 550,000 homes and businesses are still in the dark and almost 1,000 Friday flights are cancelled. The ice storm has been blamed for at least 22 deaths, including that of a pregnant woman struck by a snowplough. 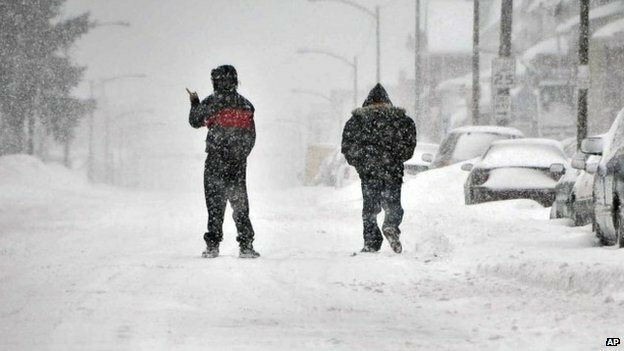 It is the latest miserable weather to pummel the winter-weary eastern US. Early this month, Washington DC, Detroit, Boston, Chicago, New York and St Louis had recorded two to three times as much snow as normal by this time in the winter season. This storm system has already dumped as much as 15in of snow in the Washington DC region and 8in around New York City by Thursday. Up to another foot is forecast in a second snowfall that began on Thursday evening and is expected to continue through Friday morning, with the heaviest precipitation in the US states of Connecticut and Massachusetts. The National Weather Service predicted the weather would ease by the weekend. “Heavy snow will continue tonight… but will begin to taper off from south to north through the morning hours on Friday,” the official forecaster said. The snow-covered streets in the nation’s capital were largely deserted on Thursday, after the federal government closed its Washington-area offices to spare its widely dispersed workforce the trouble and danger of the drive to work. On Friday, official Washington will start work two hours behind the ordinary schedule, the Office of Personnel Management said. More than 6,500 US flights were cancelled on Thursday, according to airline-tracking website FlightAware.com. Another 1,000 on Friday’s schedule have already been grounded. In New York City, Mayor Bill de Blasio was criticized for keeping schools open on Thursday despite the snow piling on the ground. The head of the city schools teachers union said it was a “mistake” to have students, parents and school staff travelling under such conditions, while a prominent meteorologist and television personality opened a public spat on Twitter with the mayor. “It’s going to take some kid or kids getting hurt before this goofball policy gets changed,” Al Roker of NBC wrote on Twitter from Sochi, Russia, where he is covering the Winter Olympics. Al Roker has a daughter in the city schools. Bill de Blasio responded that many parents depended on schools to watch over their children while they work – and noted the city had closed schools only 11 times for snow since 1978. “We were convinced that kids could get to schools this morning,” he said. The multi-day storm has been blamed for almost two dozen deaths. In New York City on Thursday, a pregnant woman was killed after being struck by a snowplough. Her baby was delivered in critical condition via caesarean section. The storm moved into the north-east on Wednesday night and Thursday morning, leaving in its southern wake a wreckage of snapped tree branches and power lines coated in as much as an inch of ice. Most of the remaining power cuts are in South Carolina and Georgia, where President Barack Obama declared a disaster, opening the way for federal aid. Forecasters said it was one of the worst storms to strike Atlanta, the largest city in the South, since 1973.